For the second-straight season Eagles DB Ellis Hobbs’ season has been cut short by a neck injury. Ellis Hobbs’ agent, Kevin Omell, confirmed that his client’s season is over. Omell said that the Eagles will place Hobbs on the injured reserve after an MRI revealed damage to a disk in his neck. This after a brutal head-on collision with the Giants’ Dave Tollefson Sunday night. No joke that Hobbs even walking is a miracle. During the hit, Hobbs’ head crunched into his body like he was a turtle. After he was down for nearly 10 minutes it was tough to see him walking let alone playing again. Luckily he gave fans a good sign -- he gave the thumbs up as he was taken off the field on a stretcher. I could go off again about the absurdity that Tollefson wasn't penalized for the hit, but instead let's look at what Hobbs move to IR means for the Birds. The loss of Hobbs really shouldn’t have a huge affect on the Eagles on the field. He had already lost his starting DB spot to Dimitri Patterson and his work as a kick returner -- the job he was doing when he was injured at the start of the third quarter -- is very replaceable by fellow DB Jorrick Calvin. Expect Calvin to be active this week to primarily work on special teams after he was left out of uniform Sunday night. 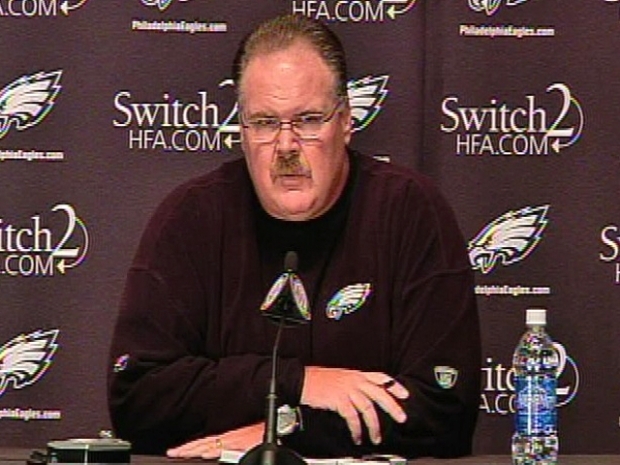 Eagles coach Andy Reid didn't mention that Hobbs was done for the season at his weekly day-after game press conference. But Big Red did mention how much he cares for Hobbs. The future for Hobbs remains uncertain. He lost eight games last season and will miss eight games again this season. If Patterson continues to succeed alongside Asante Samuel the Eagles could easily cut ties with Hobbs. Of course it’s possible that Hobbs never plays again. NFL teams are weary of neck injuries especially for forward-hitting d-backs. Let’s just hope Hobbs can recover and maybe get a shot to play again next season for the Eagles or elsewhere. Andy Reid breaks down Vick's performance in the Eagles win over the Giants Sunday.